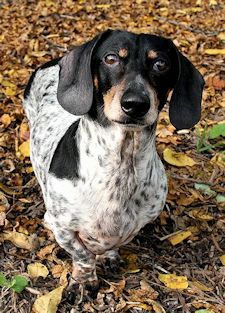 Those Special Dachshunds: Meet Odie! 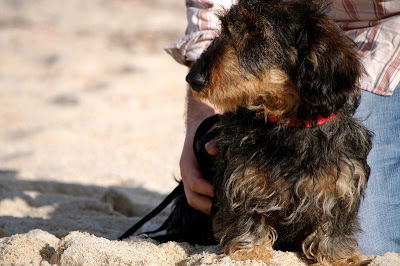 I am blessed with Odie, a wire-haired Dachshund. We hail from a sunny island - Singapore. I love your blog and look forward to read it everyday. Thank you and keep up the good work! Gaze into Odie's big ol' soulful eyes. It's Wednesday. There's Wirehairs everywhere. 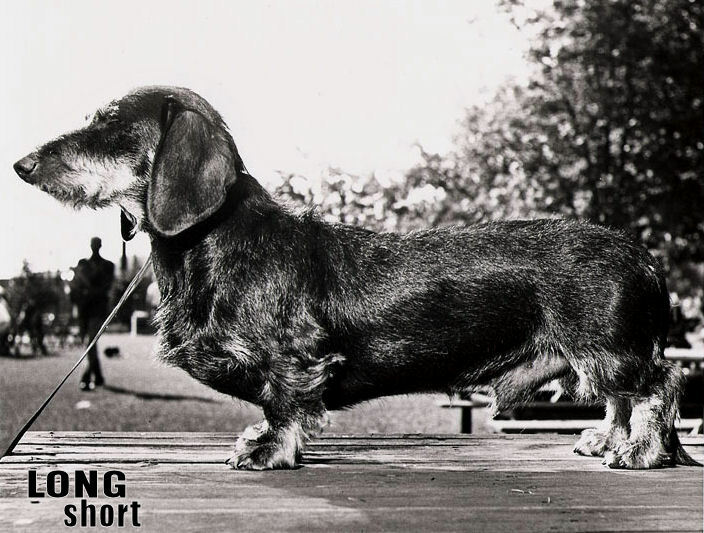 That can mean only one thing: It's Wirehair Wednesday! 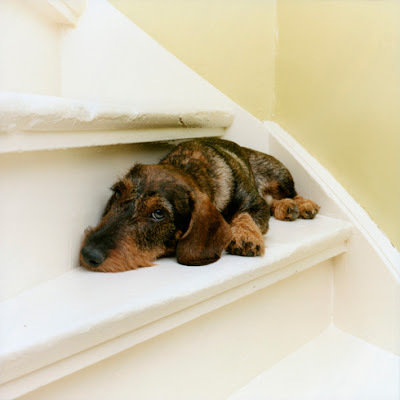 Thanks so much to our pal 'Michael-dog' for sending in the link to Dutch photographer Maarten Wetsema's website where there are several Dachshunds featured in unlikely yet highly agreeable poses under the links "Dogs in their Domestic Environment" and "Portraits of Dogs." This photo is titled Lodewijk, 2007. 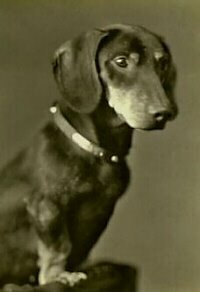 San Francisco Photographer William A. January, 1897-1965, was known for his photography and devotion to dogs in the 1940s and 50s. 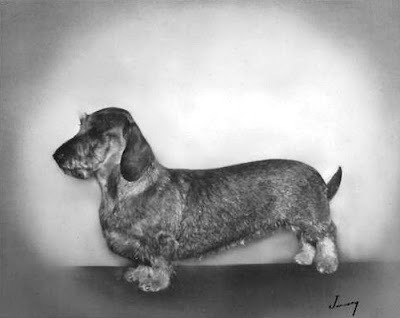 His signature "January" is seen on many Dachshund and dog photos from this era. Oh, the troubles we get ourselves into. 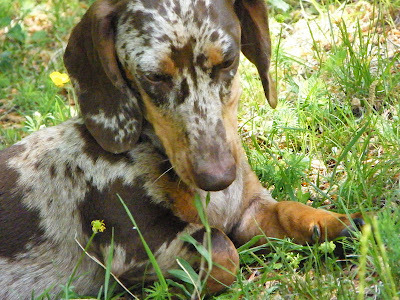 Meet black and tan wirehair 'Luce,' and his(?) human Giovanna Staub, who hail from Morbio Inferiore, Ticino, Switzerland. A walk through the mountains turned into a nightmare a few weeks ago when Luce took off running after some game and slipped off an icy slope of Monte Generoso, falling some 250 meters, or about 820 feet! His human was able to contact authorities to secure a helicopter that came to Luce's rescue. "His large dark eyes looked at me gratefully," noted his mountain rescuer. Surprisingly he was not hurt too bad, suffering a cut to the head, but otherwise fine. The helicopter rescue will cost several thousand francs, but "Luce is worth it" said Ms. Staub. Source. A little Queen, a little Dachshund, what's not to love? by French youtuber teckeltranquille. Census Time. They say we can't move forward until you mail it back. Your Long and Short of it All hostess 'Maggie' was sure confused with the race and ethnicity questions, but she opted for a write-in. Hundreds of spectators, Dachshund owners, and their pets came to the inaugural Florida Wiener Dog Derby on Sunday, March 28, 2010, at the Shell Factory in North Fort Myers, Florida. Sure looks like everyone had a great time enjoying some racing action in that glorious Florida sun. 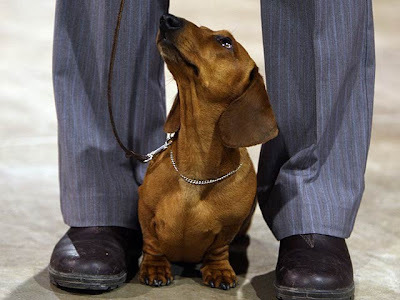 Read all the Wiener Winners and catch a nice slideshow of photos at the News-Press. Freaky Figuration: Egged on by various amalgams of psychedelic and outsider art, Surrealism and Neo-Expressionism — not to mention Philip Guston, Dana Schutz, Martin Kippenberger and Thomas Trosch and Katherine Bernhardt — many painters are veering from the hallucinatory to the naïve and back again. 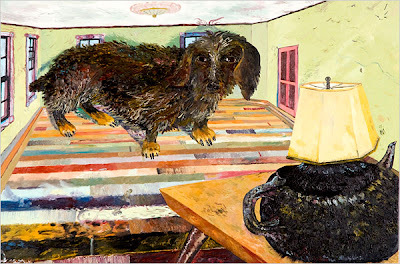 In Michael Williams’s “Loddie” (2007), it is a Dachshund, not Alice in Wonderland, that gets very big. Read more about the Modernist insistence on the separation of of representation and abstraction in painting (huh? - we just like this piece of art!) at The New York Times. Thanks to our friend 'Clancy' for sending in the link! It was the 31st Annual Wurstfest in Hermann, Missouri this last weekend, and were there Wiener Races? You betcha! They've had a Wiener Dog Derby for the last 15 years as a matter of fact. Looks like a great time was had by all. 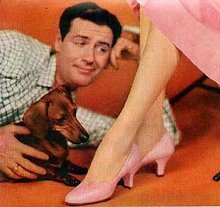 Dickie was the dog of my life; she could take orders and pose! four doctors, two of which were sons of doctors. A few years later, Dickie came into my life. 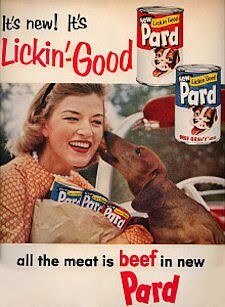 Yes... she was some dog! Tea Parties had to be much more interesting back in March of 1962 than they are in 2010. Hold on to your hats! Thanks so much to our pal 'Clancy' for sending in this poem. 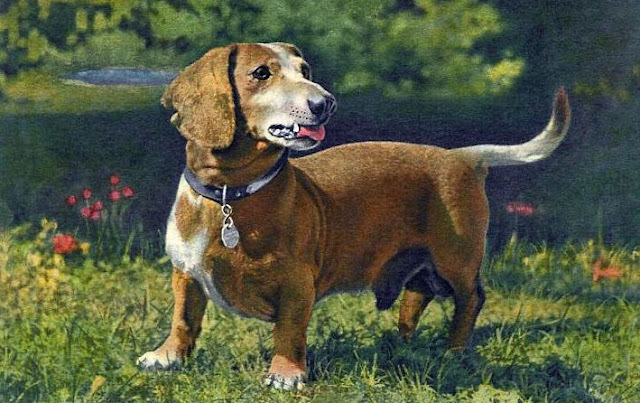 Vintage Swiss Dachshund postcard era unknown. 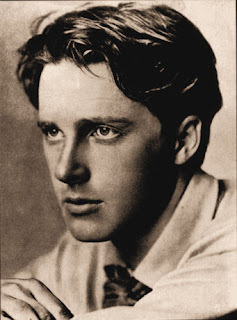 "The handsomest young man in England" according to William Butler Yeats. Sukie is a 6-month-old puppy that did not have the best start in life. She came to MWDR when the kind folks at a vet clinic called and said she needed help. She was at a pet store and somehow she got either a chemical burn or a thermal burn near her behind. No one seemed to know what happened to her. She is almost all healed and may have a scar there as she gets older. Like any other playful pup she wags her tail all the time and runs around the house. She loves chasing her foster sister 'Dilly' and rolling around playing with her. Her favorite thing in the whole world is to play with toys so a basket full is a must for this little girl. 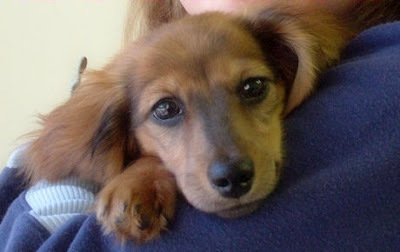 She needs to be adopted by someone that already has another young dog or an adopter wanting to adopt two doxies. At night she sleeps in the crate and sleeps through the night. She is leery of new people; especially men so a quieter environment is best for her. She will bark at anyone new and it will take her some time to bond with new people. Sukie is a very sweet pup that needs a home that has the time it takes to devote to a puppy. 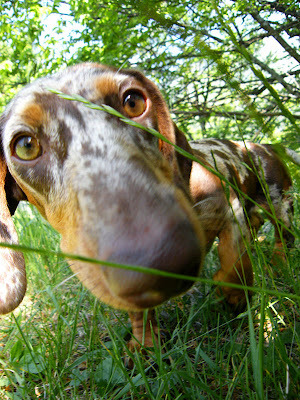 Find out more at MidWest Dachshund Rescue. It’s time to announce the winner of our latest caption contest, and what a contest it was. First off, many thanks to Dexter the Dachshund for actually retrieving the bumper [retrieving training tool] during our quasi-photo shoot. Who would have thought? And big thumbs up to the gang at Zink Calls for our prize: a great Power Hen 2 duck call ($125). Oh, yeah? I've seen you shoot. If you can call yourself a hunter, I can call myself a gun dog. Read all the entries at Field and Stream. Let Sergean'ts keep me good as new! There's a Sergeant's Dog Care Product for just about every need. 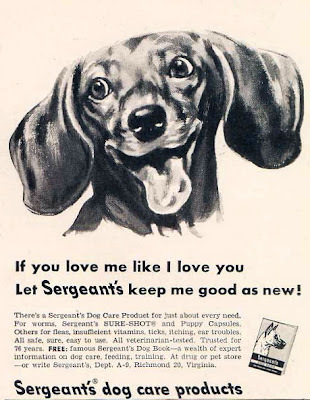 For worms, Sergeant's SURE-SHOTS and Puppy Capsules. 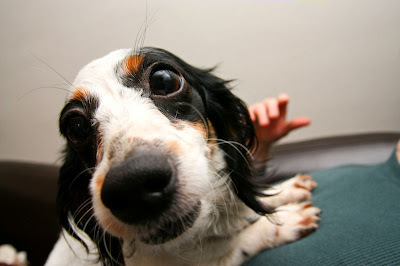 Others for fleas, insufficient vitamins, ticks, itching, ear troubles. All safe, sure, easy to use. All veterinarian-tested. Trusted for 76 years. 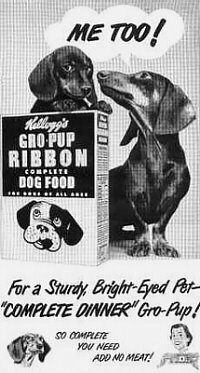 FREE: famous Sergeant's Dog Book - a wealth of expert information on dog care, feeding, training. At drug or pet store - or write Sergeant's, Dept. A-9, Richmond 20, Virginia. 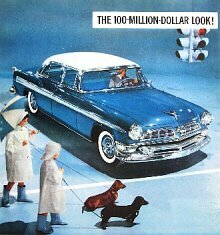 Shout out to our pal Baxter who found an original print of the image used in this ad at a local flea market. Thankfully a good samaritan spotted Brownie running through traffic, and her microchip led to her return home. “I guess this shows you don't give up. There are kind people in the world,” Lynda said. Read all about Brownie's ordeal at ABC 15. 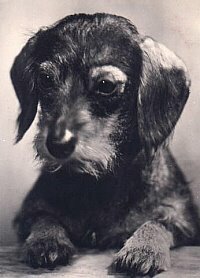 It's Wednesday, and that can mean only one thing - it's Wirehair Wednesday - a day dedicated to our elusive wirehair friends who keep such a low profile! 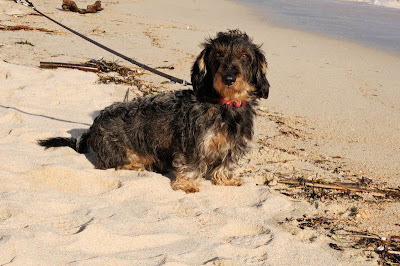 Thanks so much to Clara for sending in photos of her low profile wirehair - a handsome guy named 'Oscar.' This dapper duo hails all the way from Portugal! Putzi the famous Palm Beach Dachshund got a fish. See more videos of 'Putzi' at her youtube site: Putzi Channel. 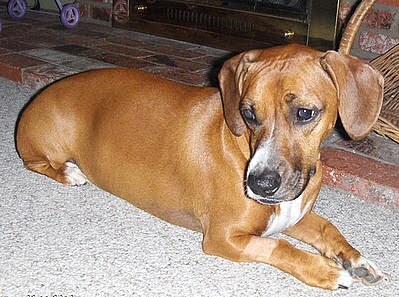 And speaking of Dachshunds and raw fish, or at least Dachshund mixes and raw fish, meet 'Della,' a cute Dachshund-Boxer mix who hails from Lake Elsinore, California. Della found herself with a serious illness after eating some remnants of a raw trout her dad had caught while fishing. The trout was infected with a parasite leading to what is commonly known as 'salmon poisoning' in dogs. If caught in time it can be treated, but it is often fatal to dogs. Oddly the parasite is harmless to humans. Read all about Della's dilemma at The Press-Enterprise. 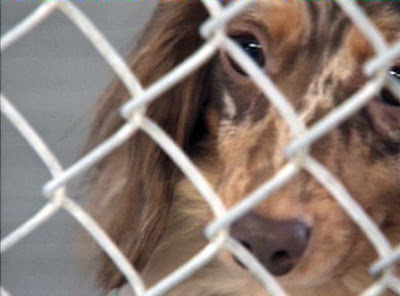 55 dogs were rescued on Monday morning from a breeder in Stone County, Missouri. 40 of those dogs were Dachshunds, but other breeds included Great Pyrenees, Beagles and mixed breeds. The raided property is near the city of Hurley, in Southeast Missouri. 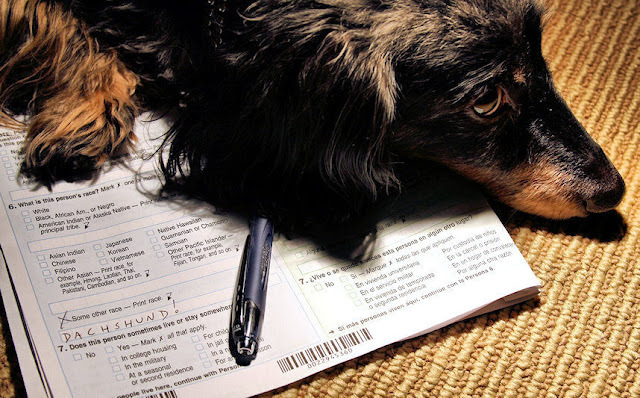 The resident had tried for several months to obtain a breeder’s permit but had not been able to make the proper improvements required by the Department of Agriculture. A search warrant was obtained by the Stone County Sheriff’s Department and they, along with the Humane Society and the Missouri Department of Agriculture carried out the rescue. Several of the dogs were extremely thin, while others had eye injuries and possible injuries to limbs. The dogs will continue to be evaluated and cared for with some ready for adoption after a March 31 disposition hearing. Sometimes we scratch our head and wonder....what were they those humans thinking? Spring may be a time when a young dog's fancy lightly turns to thoughts of love, but did you humans have to immortalize it in ceramic? Thanks to our pals Samson, Tommy, and Gina for sending in the link to this wayward couple up for auction over at eBay. According to the description: A RARE 1950's PAIR OF MINI DACHSHUNDS. THEY ARE 2 SEPERATE PIECES THAT CAN BE DISPLAYED IN A MATING POSE! BOTH STILL HAVE THE NAME LABEL PRESENT. THE GIRL IS CALLED WIFF AND THE BOY (HAS PRIVATE PART) IS CALLED PIFF. WIFF MEASURES 1 1/4" TALL. 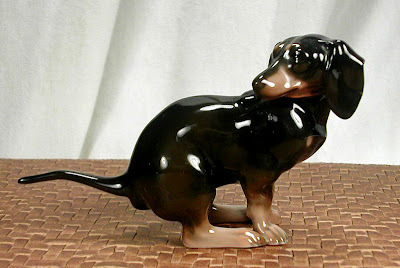 And then of course is this fairly rare German Rosenthal Dachshund. He ain't sittin' pretty, that's for sure. 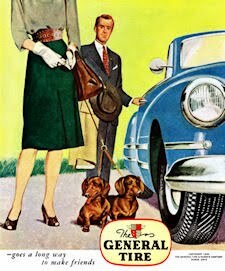 The version in a red coat seems to be a little more common than this black and tan. This piece recently sold at auction for over $300, and measures just under 3 inches tall. These pieces sometimes sell for over $500. Can we get a little privacy here? 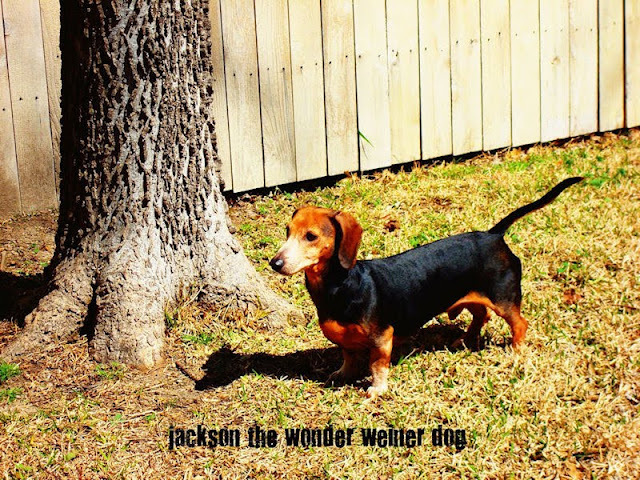 Those Special Dachshunds: Meet Jackson The Wonder Wiener Dog! Our first thought when seeing this beutiful boy was "Is he officially red or black and tan?" And we still don't know the answer. 'Jackson' is a paradachs though, that's for sure. What a handsome guy. Thanks so much to his mom, Rebecca Eby, for sending in the link to his new blog post where he has a bit of a "Spring Awakening." You can see photos of Jackson going from cold and miserable in the snow to enjoying a good roll and shake in the fresh spring grass. Don't miss it over at Bare Feet On The Dashboard. It'll make your day. Seriously. 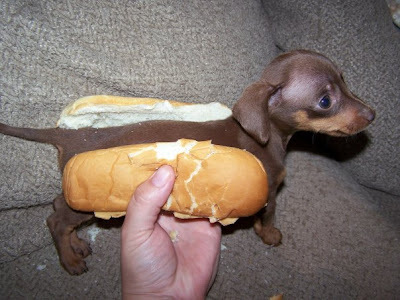 Who Is This Famous Hot Dog? You've no doubt seen this photo on the net before. 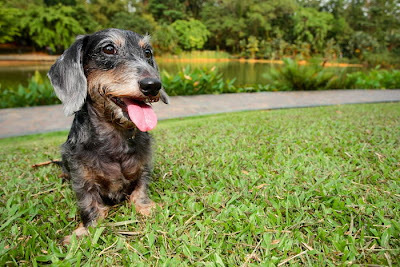 A simple google photo search for 'hot dog' will bring her up, and she's been on every Dachshund discussion board, every facebook page, every twitter page, and yes, even here on The Long and Short of it All! But who is she? We certainly didn't know when we posted her photo, and attributed her image to "unknown viral photo." Nellie was no bigger than an adult mouse when she was born prematurely, three years ago in May. She was the only one in the litter to survive after her mother's uterus ruptured, and her owners had to break open the sac that surrounded her and rub life into her. "She is pretty special to us," Lisa said. 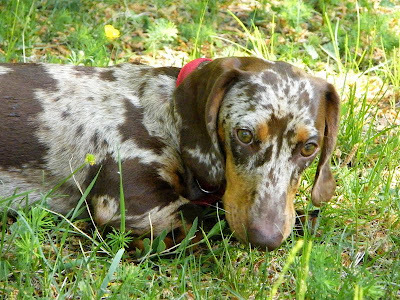 When Nellie was about 5 months old--and still a squirt, even by miniature dachshund standards--Lisa and her husband, Michael Tucci, had a stale hot dog bun in the kitchen. They wondered if Nellie would fit it in. They put the crumbling bun around her tube-shaped body, with her head popping out the front and her tail, the back. Lisa posted it on her Facebook page. "Everybody thought it was absolutely hilarious," said Lisa, whose friends loved it. Read all about Nellie and see more pics of the hot little girl at Fredericksburg.com. Like watching Pamela Anderson run in slow motion on Baywatch, Your Long and Short of it All host 'Joey' is simply smitten with this fine girl named 'Brandy.' By youtuber by Lauren Ashe. 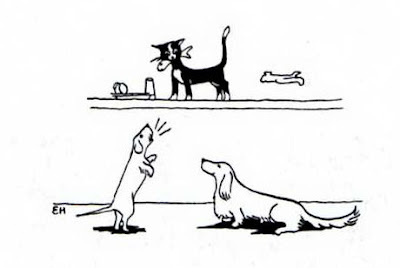 Is Your Dachshund A Drama Queen? The question reminded me of a story told by a colleague whose Dachshund shivered in a similar way when outside on the patio, wanting to come inside. After initially feeling sorry for the dog, and allowing it to come inside each time, she decided to do a simple experiment. When she next saw the dog shivering outside, she stepped away from the window where he could see her, and instead she observed the animal from a hidden viewpoint. She discovered that when the dog thought that he was not been observed, he behaved normally, with no shivering. As soon as his owner stepped back into his vision, he stood in a miserable, hunched position, shivering. He’d learned that if he acted as if he was cold, he was immediately allowed back into the home, which was where he wanted to be. Of course, there are occasions when dogs shiver because they’re genuinely cold. You can’t ignore these behaviours, but it’s worth using a little human ingenuity to find out if they’re genuine. It’s one thing to be fooled by Meryl Streep when you’re being entertained at the movies, but quite another to be manipulated by a potential Oscar winner in your own home. 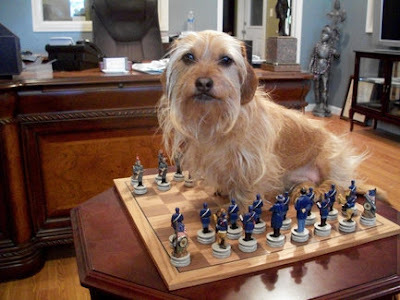 Thankfully us American Dachshunds would never do this. Must be a British thing. 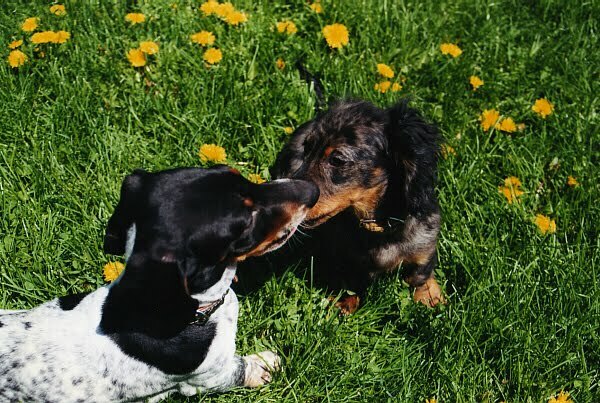 A Note from Joey and Maggie: Spring! Ahhh, sweet, sweet, memories of Spring. We were just about 3 months old in this photo taken 9 years ago. Joey had lots of hair, and Maggie was a lot less jaded than she is today. We love the chance to go for long walks in the park whenever the weather is nice, so it has been a great week. But Mother Nature played a cruel trick on us in Chicago - it was nearing 70 degrees several days this last week when the weekend turned sour with freezing rain and snow! Joey was just beside himself when he saw the wet snow was back. Maggie is a happy girl regardless, although she's not looking forward to the Spring thunderstorms. But all is well; we know those warm sunny days are just a few weeks away. While we'll miss the glorious rays of sunshine in the south-facing windows, we welcome those same rays in the west windows. Life is good. Meanwhile, we've been busy with site updates for The Long and Short of it All. We swtiched a few things around, added some new features, and tried to stick to our favorite colors - did someone say "Black and Tan?" And we kept a little aqua for mid-century vintage good measure. The header photo is a little too big for our liking, but the new format requires a large photo. Mabye we'll get used to it or come up with some alternative. Thanks for all the great submissions lately - we're a bit behind on our email - so much so that it's going to take several weeks to catch up! We offer our humblest apologies if we can't get back to you right away - and some submissions we miss altogether, although it is never our intent, and we're extremely sorry. More great things are on the way, we promise! 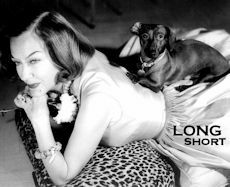 "To update this site almost every day with Dachshund news from around the world, Dachshund stories, videos, famous Dachshunds, photos, and history. 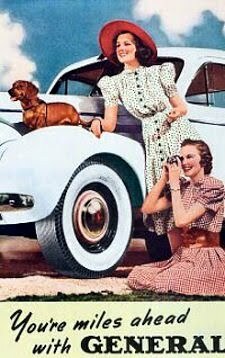 We hope to keep everything stress free and ad free....just a fun place for Dachshund lovers to kick back, relax, (with your doxie on your lap!) 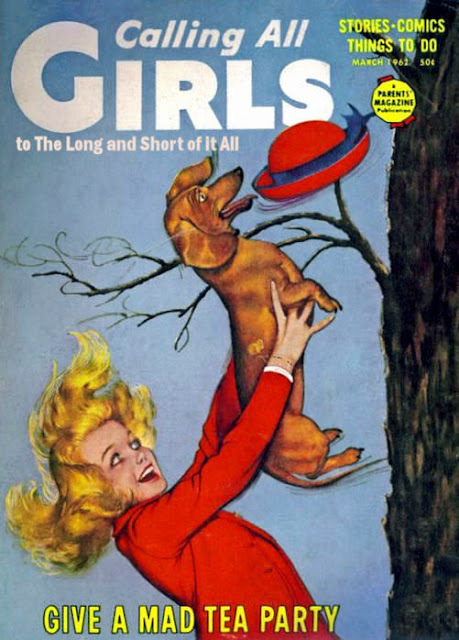 and read all about fun Dachshund hyjinx." We hope we're staying on course. Thanks for sticking with us! Celebrate Spring! Those Special Dachshunds: Meet Princess Lea! I'm a proud owner of a Dachshund called Princess Lea. I must say I love your page, because of funny and serious stories and pictures. We included some pictures so you would know who we are if we met on the street! :D Best regards! Dale Fisher will host a dachshund race at the St. Johns County Fairgrounds to raise money for the local 4H club. 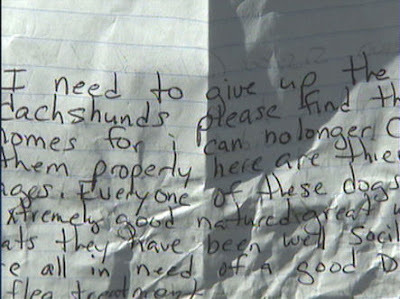 He said he contacted Toni Gossard, the founder of the National Dachshund Races to see if they would like to help out. He said Gossard agreed, and Fisher said he will pay for her travel expenses from Ohio to St. Augustine. In exchange, Gossard would provide a dog racing track and her 10 years of dog racing experience. As the plans were laid out, Fisher said the expenses became more than he could handle. "As the months went by, as we started to develop this more, it went into multiples of thousands of dollars," he said. Fisher said when Gossard asked for half of the money up front, it went beyond his 4H Club budget. Fisher said he canceled his deal with Gossard and planned to go forward with the races without her help. That is when he said the war of words began through e-mail. And that's where we stop excerpting, but if you like drama, read it all at News 4 Jax. Is this really news? 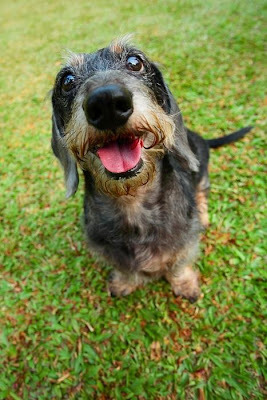 Sometimes we get so caught up in all the Dachshund news that we forget to stop and take the time to thank all the hard-working folks involved in Dachshund Rescue. These good folks live and breathe it every day - rescuing, fostering, providing medical care, transporting, re-homing - it's a full-time volunteer job, and boy is it appreciated. 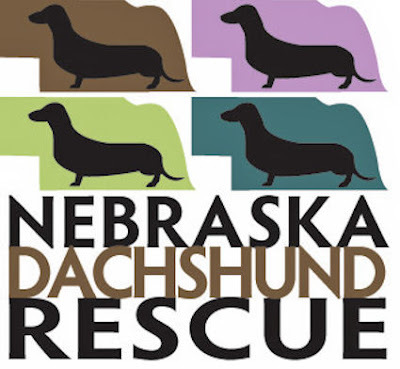 One such great group is Nebraska Dachshund Rescue. 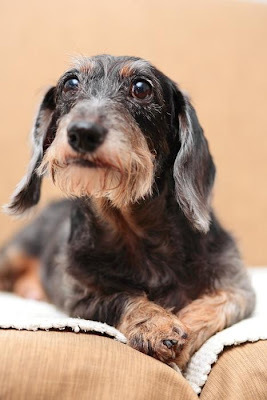 They are a non-profit, 501 (c) (3) organization based out of Omaha, Nebraska, who rescued over 200 Dachshunds in 2009 and currently have over 50 dogs who are looking for their forever homes. They cover a wide area and have foster homes from Kansas, throughout southeastern Nebraska, and into western Iowa. 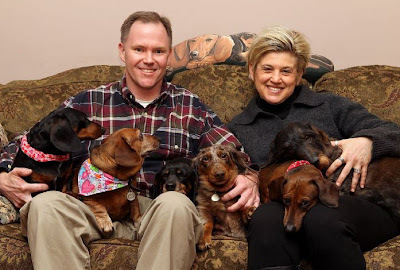 They are Dachshund afficianados and are trying to rescue as many wonderful weenies as they can. One such wonderful weenie is pictured here. Her name is 'Quinn,' and she's a former puppymill dog. She's what's known in the business as a "foster dog failure!" Her foster mom, Leah Droge, who is also the Foster Director for NDR, decided to keep her as one of her own - and we certainly see why. Read all about Quinn in the Happy Tails section of NDR. 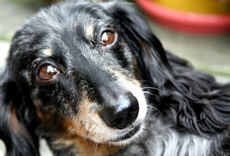 Please support Nebraska Dachshund Rescue or the Dachshund rescue organization of your choice. Thanks so much to our Kansas City pal 'Dash' for sending in the link to these. He notes: they would be perfect for someone's Easter Basket! Are you joking us? These are the coolest things ever. 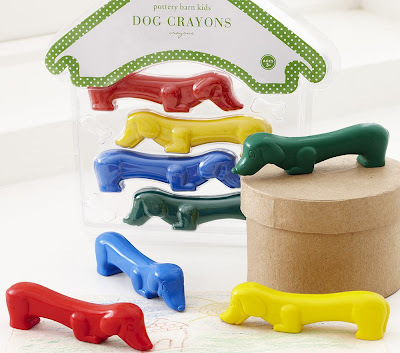 Set of 4 Dachshund-shaped crayons, just $9 at Pottery Barn Kids. Each is 0.75” wide x 3.5” long. For the kid in everyone. 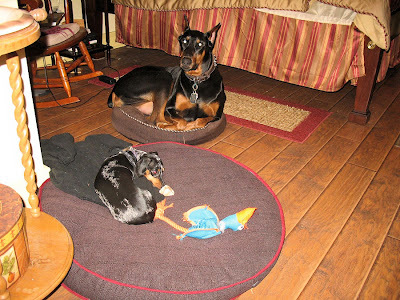 My Dachshund forcing my Doberman pinscher to lay on a bed that is far too small for him. via Reddit. Our dad often tells us that we're a day late and a dollar short, but we couldn't resist sharing this photo of those Sheridan Avenue Boys, even if it IS the day after St. Patrick's Day. Now maybe they'll loan us that dollar? p.s. Did someone say Handsome? Happy St. Patrick's Day. 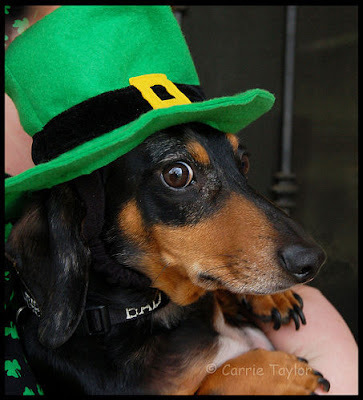 May the luck of the Irish Dachshund be with you today and every day of the year. 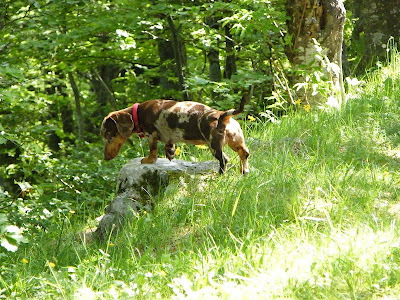 Make sure to check out more photos of one of our favorite flickr Dachshunds 'Snoopy' in his photo set: The Adventures of Snoopy. 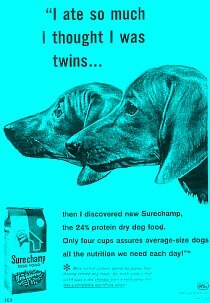 For all of our elusive wirehair friends who keep such a low profile. Photo circa 1950. Source unknown. You've come to the right place if you need a little something to brighten your day. 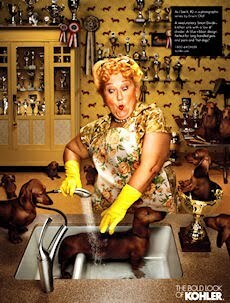 We love these Dachshunds 'Ginger' and 'Sammy,' and hope that this is just the first of many more little films to come. By youtuber ChristopherJKovach. Thanks so much to our pal 'Clancy' for sending in the link! 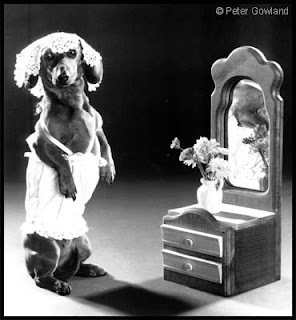 Dachshund pillows are scattered on beds and couches, figurines are perched on top of a mirrored etagere, pups' pictures hang proudly, glass canisters hold dog treats, a box of squeaky toys awaits play in the family room and a dog bed is nestled in the master bedroom. There's even a play area in the unfinished basement. Catch it all at the St. Louis Post Dispatch. 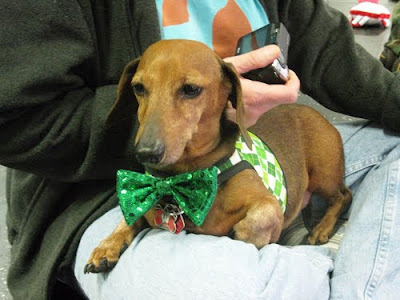 Dachshunds and their humans got together on Sunday in Libertyville, Illinois, to celebrate St. Pat's Day and to raise money for a great cause: Dodgerslist: Your disc disease (IVDD) Resource. 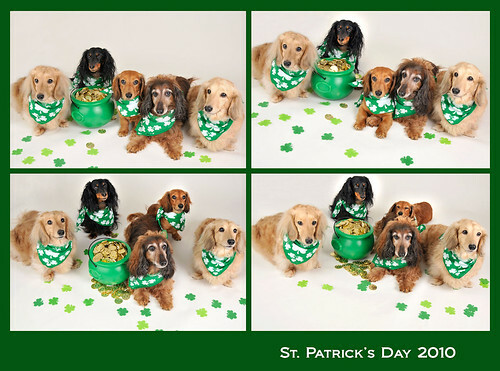 The annual Luck of the Irish Dachshund Get Together was sponsored by The Suburban Chicagoland Dachshund Lovers. 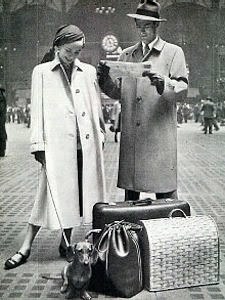 Wish we could have been 2 places at once 'cause we were already partying with the Urban Chicago Dachshund Lovers. See more pics from the Dodgerslist fundraiser at Trib Local. Thanks to our pals 'Kirby' and 'Wally' for sending in the link! Director Deborah Parker says careless breeding left a litter of puppies blind. 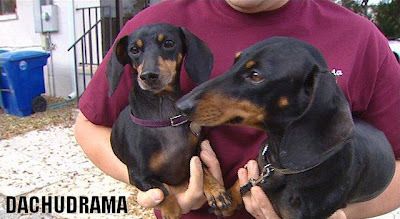 They were born with a condition called Microphthalmia, which happens when two dachshunds with the dominant "dapple" gene, are breeded together. "We're looking for homes for these puppies and we want to make sure they go to good, loving homes. Their life expectancy can be 15 years. Even though they are blind, they can live a normal life. They just need love and patience with someone who's willing to work with them," Parker told Fox 8 News. Read all about these special souls at Saint Francis Animal Sanctuary Inc.
Well, we certainly hope that all you Dachshunds got out of the house this weekend to celebrate St. Patrick's Day. We did! We went to a local Dachshund meetup yesterday and drank green beer with about 50 other Dachshunds. What a great time! 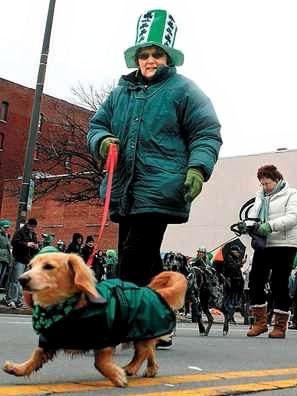 Above, this red longhair was one of about a dozen Dachshunds from the Buffalo Dachshund Club who marched behind a "wiener wagon" at the St. Pat’s parade in Buffalo, New York yesterday. Way to show that Dachshund Pride! Photo Source. 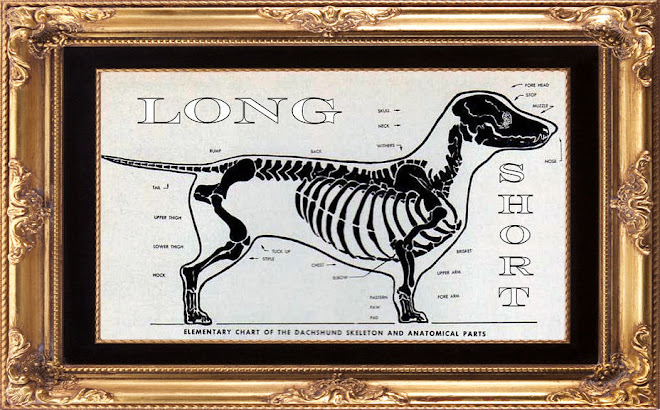 The long-haired Dachshunds showed signs of neglect, like unclipped nails and rotting teeth. "We have had this happen several times in the last 18 months, and I think a total of 28 in that time have been dropped off," said Carol Patzkowsky, the executive director of the Fairfield Area Humane Society. The dogs are all the same breed, which leads authorities to believe that the same person is to blame. "Have to pretty much suspect they came from someone who used them for breeding," said Huffman. Officials are concerned that there are more where these dogs came from. "That's why we'd like the public if they have any clue where these dogs came from, we'd like them to give us a call so we can investigate the situation and see if there's other dogs that need help," Huffman said. We're woofless. Read more and watch the news video at 10 TV News. "I'm glad it's over with, and I'm glad our dog is safe for now," Spork's owner Kelly Walker said after the hearing. "Emotionally, this has been hard on everyone involved." Tim and Kelly Walker said they feel bad about the pain the veterinary worker went through. "But we feel an apology is afforded us, too," Tim Walker said. "We feel we weren't afforded the protection we should have been." Read more at the Daily Camera or at The Animal Law Center. This story has been extremely troubling from all angles. We're glad that it's over, and that Spork, seen here going for a car ride, can go on with his life - playing with toys, chasing squirrels, napping in the sun - doing what Dachshunds do best. (photo from facebook's Save Spork) Thanks to everyone who has sent in updates on this story along the way. Over 10,000 dogs showed up 2 weeks ago for the 2010 International Kennel Club of Chicago. Once again we didn't get to go. Dad took about 50 photos though, (he FINALLY got them uploaded, ahem), and there were some beautiful Dachshunds and dogs. A Sexton Animal Clinic employee who previously worked for Ruston Animal Control said officials had tried to catch the dog in the past, but he ignored traps set to catch him and ran from anyone who even appeared to be trying to catch him. But recently, both good and bad luck finally caught up to “Ike,” injuring him but setting him up with a brighter future and more comfortable home in the long run. 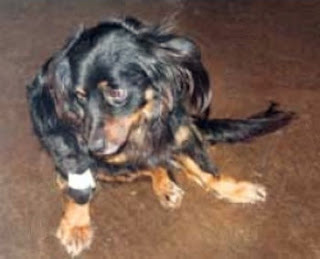 The longhaired dachshund mix had finally been hit by a car and picked up injured along I-20. Ike’s new home will be with City of Ruston employee Pat Doane and her husband. Wow. It's finally Ike's time to be loved again. Read all about him at the Ruston Daily Leader. Don't you just love this Calendar Girl? Meet 'Lucy,' a rescue wirehair who hails from Gulfport, Mississippi. After 25,000 votes on 77 entries, Lucy won the Pet Calendar Contest sponsored by Biloxi's Sun Herald. Of course she did! Lucy will go on to be featured in a 2011 Calendar the Sun Herald will produce and the Humane Society will use as a fundraiser. 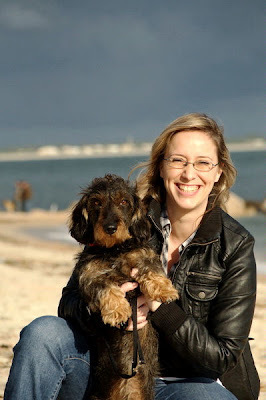 Lucy's human, Donna Rowland says: Lucy “is a wire-haired Dachshund rescued from a road where she had been hit by car. We say she died and became our little angel that night.” Read more about the contest at the Sun Herald. It began when we promised each other that there would be no more pets. To seal it, we signed a lease for a beautiful apartment with wall-to-wall carpet and no pets allowed. Only a few days later we found Sylvester. He was such a small kitten, lying on the concrete patio of the office where I was working. He wouldn't eat and he couldn't walk. Rain clouds were gathering as night fell. He would be dead in the morning. How could I leave him to die in the rain? Three months later, Sylvester could walk around and even run some, and he had developed that terrible Siamese howl so we were sure the landlord would soon find out about him. The howl and several other Siamese traits revealed at least half of his ancestry. We started looking for a home for him. We asked everybody we knew - and that was how we found out about Charlie's puppy. Our bachelor friend Charlie had acquired this adorable puppy, which had just eaten $110 worth of couch, $50 worth of shoes, and other items such as trouser legs, socks, and pillows. Somehow Charlie was sitting on our couch with the puppy, and the puppy looked almost as sad as Charlie. He told us she was a longhaired Dachshund from a good family. We could see plainly that she was made to love. But we were firm. Only as a last resort - if he could find no one else at all - would we take this puppy. Well, we named her Sugar. And that is how we got evicted from our beautiful apartment and went looking for a new home with a half-grown Siamese cat and a 6-month old Longhaired Dachshund puppy. From the start, Sylvester and Sugar got along famously. They played, slept and ate together, and, when at last we found a home with a yard for them to run in, they hunted together. Cats will wander, and as Sylvester grew, he hunted farther and farther from home. He always returned at night, but Sugar was lonely in the daytime. Which was how we came to get Little Lucy. A newfound friend had told us about Little Lucy, a Miniature Wire. After having been sold as a puppy several years before, she had been mysteriously returned. Apparently her life had not been happy. Lucy was granted to us on probation, as it were, to see if she would fit in. At first she was reserved, but soon her outgoing nature overcame the shyness and she attached herself to all of us - except Sylvester. The cat was too much for her. Lucy ate Sylvester's food every chance she got, and teased and tormented him to the ragged edge of his great patience. Until the night of the attack, when the Tom from up the hill got our cat and bested him and finally cornered him screaming against the stairs. The dogs flew out of the house. Sugar separated the cats, and Lucy took after the Tom, sending him scooting up the tree and out of the yard. We got our battered cat into the house and discovered he was not too badly hurt, just painfully clawed, and Sugar and Lucy sat by, anxiously waiting the first response from their friend. I imagine Sylvester was surprised to feel Lucy licking his face! Well, they are all a happy family now. The first hunting trip Sylvester made after his recovery, he brought back the prize pieces of what must have been a rather large gopher and dropped them by Lucy's dish. It was nice of him, but when I found them - by stepping in them at 5:30 on a Monday morning, groping for the light switch in the kitchen - I just said "Someday," as I bent down to see in what I had stepped, "someday we are not going to have any more pets!" I hope nobody was listening. Crufts, the "world's largest dog show" begins today in Birmingham, England, and despite the troubling press the organization has received, the show will go on, with nearly 28,000 dogs competing over the next several days. 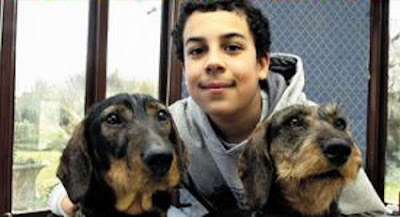 Above, 12-year-old Elliot Haywood, who hails from Devizes, will be one of the youngest handlers competing at this year's event; he will be handling his grandmother's Dachshunds seen here, 'Cleo,' and 'Razzy.' We're rootin' for ya! His grandmother said: “Elliot is not in the least nervous about competing against adults. In fact, I think he prefers that to being in competition with people his own age.” Source. Keep up with Crufts at the official site. Hounds are being judged on Friday. We'll do our best to provide highlights. Gimme that paw. 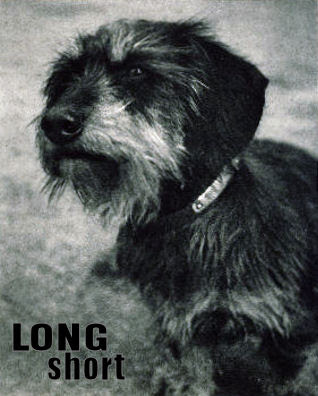 For all of our elusive wirehair friends who keep such a low profile. Why don't they make collars like that anymore? Vintage 1940s photo source unknown. Are You Ready For Saint Patrick's Day?